Apple and Microsoft delivered their quarterly earnings report yesterday. Both are organizations who have been at the forefront of Technological Innovation in a concerted way. It is fascinating--as these data shows (Source: the Financial Times & The Business Insider) that Apple continues to be an "iphone" Company as it gears up for Iphone 6. The growth is slowing though. As for Microsoft, it has begun a "lean journey" as it announced 18,000 people will be let go. It was amazing to see the Microsoft Stock at an all time high as it tries to figure out how to continue the transformation it began under Steve Ballmer to compete in the Mobile/CLoud World that we have before us. Apple on Tuesday reported its earnings for the July quarter. Revenue was largely in line with expectations at about $37.43 billion on $1.28 earnings per share, and so were iPhone sales, at around 35.2 million units sold for the quarter — up about 13% year-over-year. 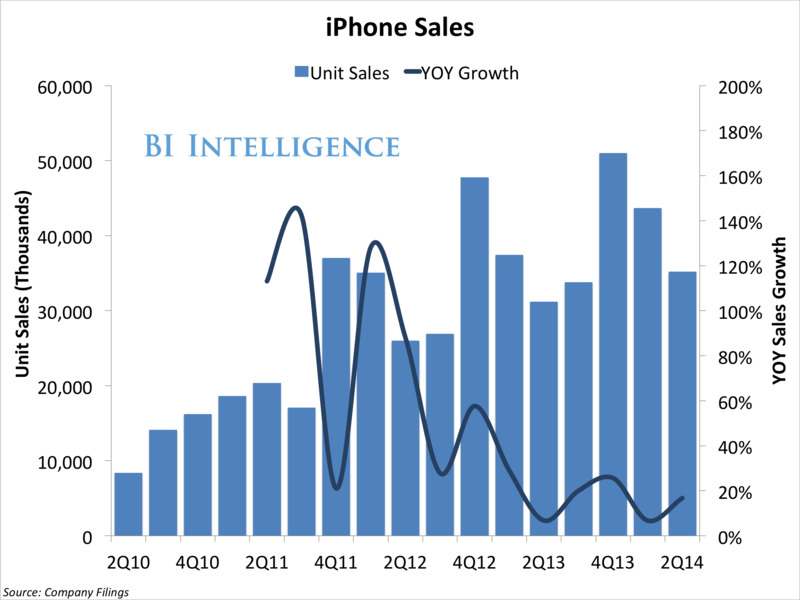 Though iPhone sales are steadily rising on average each year, growth of the device year-over-year actually seems to be slowing down since the end of 2012, around the release of the iPhone 5. Apple last year released two iPhone models for the first time, the iPhone 5S and 5C, but is expected to release at least one larger iPhone model this year with a 4.7-inch screen. This was underscored in this report form the Sydney Morning which could be accessed by clicking ont here.